As part of the Lucas TCS contract with The Bend Motorsport Park, work has recently focused on the 54 metre long emergency underpass, which also includes the installation of a number of 3.6 metre tall pre-cast concrete box culverts. The underpass allows for emergency and maintenance services to access the inside of the track in the fastest and most safe way. Lucas TCS upgraded McNamara Road, a 52km road from Barkly Highway to Mount Clark in Central Queensland. The upgrade involved the reconstruction, realignment and sealing of existing road and the processing of 400,000 tonnes of crushed pavement material. Project works included clear and grub, topsoil strip, survey and set-out, establishment of borrow pits, borrow pit extraction, material haulage, stockpiling, blending and conditioning of stockpile materials, crushing & screening, earthworks, subgrade preparation, trimming & compaction, road reconstruction, traffic management and diversion tracks, dust suppression, installation of culverts, shotcrete head walls and installation of road furniture. Being involved with South Australia's largest infrastructure project has been a highlight for the Lucas TCS Civil team. The New Royal Adelaide Hospital Project is currently under construction and is set to be completed in 2016. Lucas TCS were engaged by HYLC Joint Venture to undertake the Ground Works Excavation and Back Fill Zones Stage 1, for this project which was successfully completed in November 2014. In addition to the Stage 1 Project, Lucas TCS was successful in an additional contract and is currently engaged with HYLC for Stage 2 of the project for External Works. The Jacinth Ambrosia mine is one of the world’s largest mineral sands mines located 270km west of Ceduna. Construction included a permanent village for 300 personnel, 2000m airstrip, over 92km of major road works, bulk earthworks, process water dams, environmental dams, 5,500m3 of site batched concrete, 4000 hold down bolts, 14km of underground services for the process facility including fire and process water, communication lines and other utilities. Despite the strict environmental conditions due to its location within a national park the project was completed in just over 12 months with no LTI’s or environmental breaches 6 months ahead of schedule. Lucas TCS workforce entailed 180 personnel working across 7 contracts to complete all civil works and trial mining and Lucas TCS were instrumental in the project achieving multiple awards from industry bodies. In 2012, Lucas TCS constructed 22 km of rail embankment for the Solomon Spur Rail project for the in the Pilbara, 300 km south of Port Headland, Western Australia. The work involved the sourcing, hauling, compacting and trimming of 500,000 m3 of earth fill and suballast capping and pavement fill as well as over 6 km of steel culvert structures, rehabilitation and access roads. Between August 2011 and September 2012, Lucas TCS was contracted by Arrium Mining to construct 97km of heavy haul road to service the new Peculiar Knob Iron Ore mine site. Contracted works included the construction of a heavy haul road for heavy axle loads and extreme wheel loading from truck movements transporting 4 MTPA. The pavements in areas exceed 700 mm in depth and all materials were selectively sourced, won, processed and crushed where applicable to obtain DTEI specification products for the construction. Also constructed were rail embankments and turnouts, culverts, turkey's nests, various hard stands for crushing and ROM stockpiles and an underpass/bridge structure on the Stuart Highway. This is the third Stuart Highway underpass that Lucas has constructed for various clients within a 30km radius within the last 5 years. From 2006 to 2008 Lucas TCS worked extensively for Oz Minerals then Oxiana and completed the majority of the civil earthworks and civil infrastructure projects for the Prominent Hill mine site. In line with our community development commitment, we met and exceeded Oz Mineral’s corporate objective of local and indigenous employment, with approximately 15% local indigenous personnel on site. Works included Topsoil stripping for the mine footprint, 2000M airstrip, bulk earthworks, 140km of mine site access and concentrate haul roads, tailings storage facility and process plant civil works for the copper-gold mine, 650 km north-west of Adelaide. No LTI’s were recorded on the project. In 2012, Lucas TCS completed the construction of a 47 km Haul Road for Ivanhoe Australia Limited. The road stretched from Mt Dore to Osborne, as part of the Osborne Mine. The scope included clearing and grubbing, topsoil stripping, the cut and filling of approximately 500,000m3 of site won material, pavement construction, and close to 50 culvert crossings and the Mort River crossing, the rehabilitation of areas impacted by construction activities. The project involved a significant re-design and optimisation through construction to facilitate redefined project objectives. The project was completed both ahead of schedule and under budget. 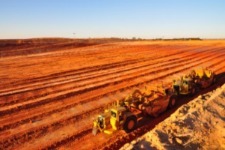 Lucas TCS was awarded the first contract on the Tropicana Gold Project in Western Australia to construct 223km of heavy haul road to service the new Tropicana Gold mine site located 300km North East of Kalgoorlie. The project included the construction of turkey's nests, hardstands and the construction of a precast 66m long bridge over the Ponton Creek. Lucas TCS also provided camp accommodation and all facilities for the contract onsite and prior to construction designed and built a 250mm—24km buried bore field delivery pipeline to service the project with water. The Project encompassed 2 accommodation camps and multiple work fronts to complete the project in the 12 month time frame including mobilisation and establishment. Breakwater construction, dredging, harbour excavation, harbour wharf and retaining walls, boat ramps, pipelines, landscaping, concrete construction, roads and services for a residential and commercial marina development. In 2014, Lucas TCS completed a road works contract for the City of Whyalla involving the duplication of Jenkins Avenue, and construction of a new roundabout to facilitate future increased traffic flows associated with the next two stages of the Ocean Eyre Residential Estate. Works were undertaken whilst the current single lane of traffic remained operational to the public. The scope of works included traffic management, stripping of topsoil, cut and fill, trim and compaction of subgrade and base courses, construction of a median island and pedestrian refugees, relocaiton of services, kerb and gutter, footpaths and pram ramps, house drains, installtion of new stormwater and connection to the existing stormwater system, asphalt, line marking, electrical works, road signage and holding rails. In 2013, Lucas TCS was engaged to complete two access road construction contracts at the Dugald River Mine for MMG Limited. The first conract was for the main access road constructio of approximately 10 km in length, with the secong being the village access road approximately 2 km in length. Both projects were successfully run concurrently. The main access road included 11 culvert and river crossings, and a large bridge structure 80m in lengh. An emergency airstrip was in-built to the access road for use by the Royal Flying Doctor Services. These works were undertaken with an accelerated program and time frame due to the site's geographical location, ensuring the project works were completed prior to the onset of the wet season. Magnetite project near Coober Pedy. Services included overburden stripping, drill and blast, load and haul, crushing of iron ore and construction of an underpass on Stuart Highway. Lucas TCS at the Holcim Quarry doing Load and haul, overburden stripping, plant hire and crushing. Lucas TCS completed a major contract for the construction of stages 2A and 2C of the Mt Barker Bluestone Estate Subdivision located on Hurling Drive at Mount Barker. The works included bulk earthworks, local road network upgrades, over 10km of underground services, retaining walls, creek diversions, road construction and landscaping activities to facilitate the development of approx. 120 new allotments. Lucas TCS has completed works on the Zig Zag Pilot Pond for Origin Energy. The project was located 40km from Toowoomba in southern Queensland. The works included cut and fill earthworks and pavement construction for a new pond. Lucas TCS was involved with the constructing of the State Aquatic Centre and GP Plus Building for Candetti Constructions. Works included Bulk excavation and removal of approximately 30,000m3 of material, detailed excavation and backfilling to footings, columns and retaining walls and construction of roads and pavements. Lucas TCS we involved in the project for Candetti Constructions which involved approximately 10,000m3 of material was imported to construct the Sulphur Storage Shed and approximately another 10,000m3 will be required to build the roadway to subgrade. Once this has been achieved the roadway will need to be pre-loaded with another 13,000m3 of material being a combination of site won and imported material. Works included construction of all-weather haul roads; stripping and preparation of stockpile areas; unloading of hopper barges, haul and dump to stockpile for testing approx. 400,000m3 of upper and lower layer materials; validating and testing of stockpiled materials; place and compact approx. 150,000m3 material from stockpile in designated areas; excavate, haul and dump to stockpile approx. 47,000m3 for shiplift (up to 20 metres below existing ground level); maintain records of material movements on-site including testing, analysis and reporting of soils for contamination. Works included clearing and stockpiling vegetative topsoil; cut and fill to design subgrade; excavate, moisture condition and re-compact existing subgrade; excavate and trim retention dam and swale drains; rock-breaking; construct base courses for approx. 25,000m2 growing rooms pads and concrete pavements and approx. 10,000m2 of AC pavements including kerbing and line marking. Works involved conditioning and compacting of existing subgrade and the supply of approximately 30,000 tonnes of material from Southern Waste Depot at Maslins. Lucas TCS provided the bulk fill and earthworks portion of the contract. Works completed under tight programming on time. Lucas TCS operated as a contractor to the Joint Venture consortium undertook bulk earthworks, blasting, screening mound construction, environmental earthworks, wetland construction, shared path construction and pavement preparation. Cut to fill of 2 million tonnes of material. Preliminary earthworks commenced February 2000; Lucas TCS' portion of the works was in excess of $10 Million. The project covered over 12kms through built up areas. Including the supply of approximately 150,000 tonnes of material from Southern Waste Depot at Maslins. Lucas TCS provided the bulk fill and earthworks portion of the contract along with fire mains and common service trenches. All earthworks were undertaken under increased security conditions due to the airside nature of the works. We have undertaken numerous construction contracts for AAL. Contracted to construct approximately 60,000 m2 of building platform, car parks and access roads including rock excavation and stormwater contracts, concrete works, base courses and pavements. All works were performed within a very intensive construction program. Construction of a clay lined tailings dam of approximately 4500 ML. Work was undertaken utilizing graders, dozers, water carts, compactors and scrapers and involved bulk cut and fill work. Works including roadway construction, large culvert crossings, stormwater drainage and approximately 1km of drainage channel and detention basin construction at Adelaide Airport to provide infrastructure for the newly constructed Burbridge Business Park. Works were undertaken in severe weather conditions by using articulated dump trucks and swamp dozers to complete the works on time. Contracted to construct Stages 7 and 8a of the Marina Hindmarsh Island, Lucas TCS provided bulk excavation, lagoon edging and roadway construction for the next stage of sale at the Marina Hindmarsh Island. Currently constructing Stage 8b. In 2012, Lucas TCS completed the construction of a 47km Haul Road for Ivanhoe Australia Limited. The road stretched from Mt Dore to Osborne, as part of the Osborne Mine. Lucas TCS continue to be the lead mining contractor at Arrium Minings Iron Baron Iron Ore Mine site. Works include load and haul, drill and blast and all major and minor civil works including road construction, Rom Pads and train load-out facilities . Lucas TCS are contracted to mine 3.2 million BCM per annum of a total of 16 million BCM over the duration. Lucas TCS completed a contract for Murray Zircon at the Mindarie site in July, 2015. Completed in just under three years, the contract involved mining over 15,500,000 m3 of overburden, as well as seven million tonnes of ore providing continuous feed to the Murray Zircon Processing Plant. In addition, Lucas TCS also completed the construciton of a tailings cell, and maintained progressive rehabilitation of the Mindarie Mineral Sands Mine near Karoonda, South Australia. As this project was situated on freehold darming land, Lucas TCS required adherence to stringent mining and rehabilitation conditions on site. As a result, we liaised closely with Murray Zircon to ensure all of the specific project requiremetns and expectations were met. Lucas TCS have been engaged at the Iron Baron Iron Ore Mine to Crush and Screen Iron ore at Iron Baron for feeding their OBP plant and direct shipping ore at an approx. rate of 3 MTPA. Works include Crushing, Screening, Load and Haul, OBP feed, Train Loading and side casting. Lucas TCS sourced and constructed a purpose built modular crushing plant and overland conveyor which is capable for the performance of the works on a continuous 24 hours a day, 365 days a year basis. Lucas TCS is currently undertaking a mining pit expansion project for CopperChem at the White Dam Mine in South Australia. With a 12-month project duration, the works involve expanding the two existing mining pits where ore will be crushed, screened and stacked for gold extraction. Throughout this time, Lucas TCS anticipates to mine an estimated three million tonnes of rock. This is the second contract Lucas TCS has undertaken at White Dam, having successfully completed contract mining and civil earthworks on site for Polymetals EXCO JV. With a duration of three years, Lucas TCS completed all services on site, incoluding contract mining, drill and blast, ore crushing, lime carting, survey, topsoil stripping and site rehabilitation. We were also responsible for the construction of leach pads, water treatment ponds, W pregnant solution swales and watercourse division. Intially a 24-month contract, Lucas TCS was awarded an extension for a second satellite pit to mine a total of 4.8 Million BCM. Undertaken on a double shift operation, the project was completed with no LTI's, and a higher than budgeted gold recovery, higher tonnage and lower dilution for our client. Between 2012 and 2014, Lucas TCS undertook the Contract Mining at the Wonawinta Mine site, located approximately one-hour south of Cobar, New South Wales. With an expected mine life of approximately four years, the Wonawinta Mine was one of the largest pure silver mining projects in Australia. Lucas TCS was contracted to move approximately 16 million BCM (Bulk Cubic Meters) of overburden and ore. This contract entailed all load and haul activities, drill and blast, grade control drilling, process plant feed and construction of the mine's tailings storage facility. Lucas TCS was awarded the first contract on the Tropicana Gold Project. This contract involved the construction of 223 km of heavy haul road to service the new Tropicana Gold Mine, located 300 km north-east of Kalgoorlie, Western Australia. The project included the construction of turkey's nests, hardstands, and a precast 66 meter long bridge over the Ponton Creek. Lucas TCS also provided camp accomodation and all facilities for the contractor on site. Prior to construction, Lucas TCS designed and built a 250 mm - 24 km buried bore field delivery pipeline to service the project with water. The Project encompassed 2 accommodation camps and multiple work fronts to complete the project in the 12-month time frame including mobilisation and establishment. The Jacinth Ambrosia mine is one of the world's largest mineral sands mine, loocated 270 km west of Ceduna, South Australia. The project's construction works included a permanent village for 300 personnel, a 2000m airstrip, over 92 km of major roadworks, bulk earthworks, process water dams, environmental dams, 5,500m3 of site batched concrete, 4000 hold down bolts, 14 km of underground services for the process facility including fire and process water, communication lines and other utilities. Despite strict environmental conditions due to the site's location within a national park, Lucas TCS completed the project in just over 12 months with no LTI's or environmental breaches. With a workforce entailing 180 personnel across seven contracts, the required works were completed six months ahead of schedule. Lucas TCS was instrumental in the project achieving multiple awards from industry bodies. Both stages of the TSF uplift. In line with our community development commitment, Lucas TCS soundly met OZ Minerals' corporate objectives regarding local and Indigenous personnel throughout these contracts. Load and haul, overburden stripping, plant hire and crushing. Contract equipment supplier for load and haul, overburden removal, shiploading, rehabilitation works, blast hole drilling, crushing, labour and plant hire services. Historically Lucas TCS provided load and haul services to Penrice in the form of two 120 tonne excavators and ten 60 tonne rigid dump trucks including ancillary equipment of grader, dozer and water trucks. This equipment was contracted for campaign overburden removal of a target 50,000 tonne per week from the mine to management/construction of waste dumps. Due to the location of the mine Lucas TCS had to take into account sensitive environmental issues in relation to the above works. Lucas TCS provided mobile crushing plants in the form of Metso LT1213S impactors and screens producing a variety of products from rail ballast to construction materials and aggregates. In addition Lucas TCS supplied plant on an hourly hire basis to support Penrice’s existing fleet of equipment including loaders, excavators, dozers, haul trucks and crushing/screening equipment. Lucas TCS has been engaged by Arrium Mining for the past 6 years to crush and screen iron ore at Iron Baron site. In addition, the Lucas TCS team have been contracted to perform drill & blast operations whilst on this project. Lucas TCS had a long-standing contract with former Penrice Mining Operation located at Angaston in the Barossa Valley.Historically Lucas TCS has provided load and haul services to Penrice in the form of two 120 tonne excavators and ten 60 tonne rigid dump trucks including ancillary equipment of grader, dozer and water trucks. This equipment was contracted for campaign overburden removal of a target 50,000 tonne per week from the mine to management/construction of waste dumps. Due to the location of the mine Lucas TCS had to take into account sensitive environmental issues in relation to the above works.Lucas TCS provided mobile crushing plants in the form of Metso LT1213S impactors and screens producing a variety of products from rail ballast to construction materials and aggregates. Operating in a hard rock quarry of Dolomite at Montacute, near Adelaide, Lucas TCS provided load and haul of production rock to crusher and removal and placement of overburden material in an operating quarry mine site. Lucas TCS also supplies plant hire to Montacute quarry for the crushing and stockpiling areas. Lucas TCS was also responsible for the maintenance and upgrade of the safe haul and access tracks within the mine site. Lucas TCS was the principal contractor for many years, for removal and placement of overburden material at the OneSteel Ardrossan Dolomite mine site since the early 1990’s. Lucas TCS supplied plant hire to OneSteel for drilling and ancillary equipment. Lucas TCS again is responsible for the maintenance and upgrade of equipment at the mine site. Lucas TCS had been previously contracted by McLaren Vale Quarries for various works for approximately 20 years. The scope of works included overburden removal, quarry development, haul road construction and quarry rehabilitation. Lucas TCS held the contract for mining activities including topsoil stripping, waste removal of approximately 400,000 tonnes per annum, quarry to crusher, and 600,000 per annum, reclaiming stockpiles, quarry maintenance, development and rehabilitation. Lucas TCS operates three Metso LT1213S Mobile Impact Crusher’s capable of crushing and screening upwards of 200 tonnes per hour of road base and construction materials.Campaigns of up to 800,000 tonnes for mining companies and road projects have been undertaken. Lucas TCS completed Civil works for Nyrstar Port Pirie Smelter Transformation Project including bulk earthworks, drainage and sewerage, road pavement including hot mix asphalting, concrete works consisting of hardstands, concrete pavement and pile caps and secant piling. Lucas TCS are currently completing Stage 2 of civil works for the New Royal Adelaide Hospital. The required works involve construction of a detention basin, access roads, fencing, paving and footpaths, kerbing and guttering, gabion walls, retaining walls, base course preparation, asphalt sealing and demolition, and remediation of various structures and areas. Throughout this contract, Lucas TCS is required to coordinate activities with multiple stakeholders and contractors as there is in excess of 20 seperate contractors working simultaneously. Lucas TCS aims to maintain good relationships and clear communication with all involved, and creating a productive environment to facilitate successful work completion. Construction of two warehouse floors of approx. 2000m2 each using a laser screed and external concrete pavements hand finished. Works included all footings, retaining walls and associated rebates and were done in conjunction with all civil works to provide a valuable service to the end client. Consisting of internal and external pavements, Lucas TCS constructed approximately 2,500m2 of floor slab and associated works, including detailed trench grate work and rebates. Lucas TCS have recently completed construction of the BEA Motors warehouse at Mile End. Works included all footings, steel fixing, mezzanine slabs, approx. 4,500m2 floor slab and 2,000m2 external concrete pavements constructed with black coloured concrete. Works were carried out in association with the contaminated site remediation works, civil pavements and stormwater construction. Construction of approximately 4,000m2 of concrete slabs, retaining walls and rebates for pipe work. In May 2015, Lucas TCS completed the civils contract for the new South Central Truck Depot. A subsidiart of the CMV Group, South Central Trucks relocate to this new premises. The Project site comprised of 40,000m2 of concrete hardstands, asphalt sealed surfaces, warehouse and showrooms. The scope of works further involved earthworks and site preparation, site remediation, supply and install pavements, kerbing, asphalt, linemarking, sampling and testing. Lucas TCS is currently completing part of the Nyrstar Port Pirie Transformation project, which involves extensive upgrades to the existing smelter. One of the world's largest primary lead smelting facilities and third largest silver producer, this is a significant project for the state of South Australia. The scope of works for Lucas TCS' project work involves civil and earthworks, including bulk earthworks, drainage and sewerage. road pavement including hot mix asphalting, concrete works including hardstands, concrete pavement and pile caps, and secant piling. Recently completed the capping and closure works at Port Vincent Landfill and Arthurton Landfill to satisfy to the closure works to EPA requirements. As this project was situated on freehold darming land, Lucas TCS required adherence to stringent environmental and rehabilitation conditions on site. As a result, we liaised closely with Murray Zircon to ensure all of the specific project requiremetns and expectations were met. Scope of works included filling approx. 100,000m3 site won material to bring site to design subgrade levels; supply and lay approx. 100,000m2 of geosynthetic clay liner to the existing waste cell including subsoil capping and topsoil; wetland construction; leachate pond construction; stormwater management; supply and lay landfill gas management system; access tracks and fencing. Scope of works included excavating contaminated material from hotspots and place and compact on-site to design subgrade levels; maintaining records of material movements on and off site; supply and lay geosynthetic clay liner to cap and contain contaminated material remaining on-site; supply and lay imported capping and topsoil to bring site to design levels; swale drain construction; stormwater management; and pavements. Scope of works included removal of vegetation and dispose off site; excavation of contaminated material; removal of contaminated material to stockpile; backfill and compact excavation with onsite fill; supply and place rubble over excavation area; fortnightly turning of contaminated stockpile; demolish and remove existing building; break up and remove concrete ground slabs; site clean-up; concrete repair inside existing building and decommissioning monitoring wells. This project included the remediation of the site and groundwater decontamination to a former council works depot. Contaminated Spoil from the site was taken to Lucas TCS bioremediation facility at the Southern Waste Depot for processing prior to disposal. Backfilling and build-up of the site using imported fill from Lucas TCS facility to allow residential development. Removal of underground storage tanks was also included in the works and contaminated ground water treatment was undertaken on site. A full environmental audit was performed prior to handing over the subdivision to private building contractors for residential development. Lucas TCS acted as a project manager and joint venture partner. Scope of works included the demolition and removal from site of existing buildings, the selective excavation, onsite stockpiling, testing and ultimate disposal offsite at the Southern Waste Depot. The site located on Johannson Rd Wingfield is now an extension to the site of the ION Automotive manufacturing complex. The site measured approximately 150m x 260m and involved excavating the entire site to a depth of 2m to remove uncontrolled fill including, clinical/laboratory wastes, glass, concrete, plastic metals and ceramics. The site exceeded the EPA guidelines for clean fill disposal for arsenic, cadmium, copper, lead and zinc. 60,000 m3 of material was removed separated and recompacted for building development. Containment cell for contaminated material was constructed and covered. In conjunction with Lorenzin Construction and Urban Projects Authority (formerly MFP) involved Lucas TCS with the transportation of approximately 30,000 tonnes of contaminated material to Lucas landfill at Southern Waste and back loading with clean filling sand from the site to remediate suitable for residential use. Material was remediated with joint venture partner Flinders bioremediation at Lucas TCS specially developed and licensed facility Southern Waste depot. Project involved extensive pilot trails to establish process to treat PAH contamination. Project met the clients objectives in the fact that the highly contaminated material was removed from site and treatment could take place offsite thereby minimizing impacts on residents and site works could be completed in a timely manner. Site was developed before material had completed remediation and disposed of. Significant savings in development time and costs were achieved adopting this approach. Project involved transport of 40,000 tonnes of high level contaminated material and supply of clean backfill material for residential development. Project required licensing of Lucas facility for Enhanced Thermal conduction by Thiess and processing at our depot before final disposal to landfill. Lucas TCS has recently completed the Indulkana Main Access Road construction for DPTI in the APY Lands. The project involved the reconstruction and bitumous surfacing of the main access road between Indulkana and the Stuart Highway. Lucas TCS was required to complete the project works in accordance to strict environmnental management practices toward the local flora and fauna. Lucas TCS appointed a tertiary-qualified Environmental Management Representative, who was responsible for ensuring that all earthworks undertaken were completed with minimal detrimental impact to the existing environment. Since 2008, Lucas TCS has completed a number of contracts for Iluka Resources' Jacinth Ambrosia Mine development. As the required project works involved operating within natural and farming environments, Lucas TCS was required to meet stringent mining and rehabilitation conditions. Bulk earthworks exceeding one million cubic metres, dredging, harbour excavation, block walling, services and roadways in a sensitive and complex marine environment. Breakwater construction was undertaken during extreme weather conditions. Excavation and dredging to 24 metres for the shiplift facility in Port River, Adelaide. Lucas used a purpose-built 120 tonne long-reach excavator with extended boom and clamshell for the channel excavation with 24-hour carting and sorting of material to stockpiles onsite. Successful completion of earthworks, breakwater construction and rock revetment under difficult conditions and changing design targets. The project scope grew by about 50 per cent during construction while the completion date remained fixed. Lucas TCS performed all works including the redesign and construction of piles and fender struts and adjustable concrete loading ramps. The sister operation to Lucky Bay Terminal was undertaken simultaneously and included all pile structures and concrete anchors and foundations. The works also involved the redesign of the pile and struts to meet the tight timeframe. City of Port Lincoln project involving the reclamation of about 20,000 square metres of waterfront for car parking and boat launching facilities. Work involved excavation and transport of large quantities of fill, rock armour for the breakwaters and concrete boat ramp with floating hardware piling. Construction of boat ramps and breakwater structures for various district councils including Kingston, Moana and Robe. Works involved construction of cofferdams, concrete ramps, rock armour and revetment, and floating hardware. Reconstruction of the Robe breakwater including the removal and replacement of all primary and secondary armour rock and the installation of a geosynthetic filtering layer between the core and armour layers. Works conducted in heavy seas and timed to avoid interruptions to fishing fleet operations. Dewatering of the basin, excavation and compaction of block fill involving about 150,000 square metres of material, and the construction of rock walling, services and roadways. Works completed in a short timeframe and with different methodologies to suit various types of excavated materials used for block fill.